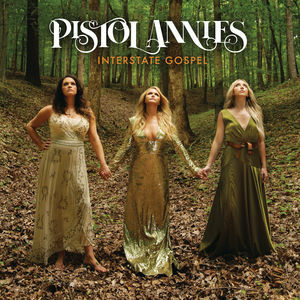 Three elves holding hands in the middle of a forest and looking to the sky with a sense of determination; the cover of the latest Pistol Annies album is rather puzzling, as is the title, Interstate Gospel. Does the trio sing in Elfish or some other invented language on this record? Not at all. For this third album, the three mega stars of contemporary country music - Miranda Lambert, Ashley Monroe and Angaleena Presley - position themselves as true warriors from a feminist point of view, challenging their struggle for freedom. After going through marriage, motherhood, divorce and midlife crises, it’s time to switch things up. The radiant music begins with a hymn to Jesus (Interstate Prelude) like any self-respecting classic country album. Though here, these hillbilly hippies combine country with gospel, hard rock country and bluegrass. Three different tonalities that form an original harmony throughout these 14 tracks. The three young women set the bar very high and their "supergroup" is clearly not to be taken lightly. From pop-country ballads (Best Years of My Life) to bouncy hillbilly music (Got My Name Changed Back), they reveal a powerful, deep and clear style of songwriting with a touch of black humour, like on the frenetic song Suggar Daddy. They deal with taboo subjects with smiles on their faces. Now that the cowboy era is over, let's make way for the cowgirls!